Council of gods before the Deluge. Engraving by Virgil Solis for Ovid's Metamorphoses Book I, 162-208. Fol. 4v, image 7. This seal depicts a favorite scene of the Old Babylonian period in which a worshiper stands among a number of gods. The worshiper, in a long robe and cap, offers an animal to the sun-god Shamash, who rests one foot on a stool and holds the saw of justice in his outstretched hand. The sun disk, nestled in a crescent, floats between the two. The goddess Lama stands with her hands raised in supplication. Behind her, a male figure in a kilt holds a curving weapon at his side, and another figure behind Shamash holds the bucket and "sprinkler" associated with fertility. A meeting of gods on the Tablet of Shamash, British Library room 55. Found in Sippar (Tell Abu Habbah), in Ancient Babylonia ; it dates from the 9th century BC and shows the sun god Shamash on the throne, in front of the Babylonian king Nabu-apla-iddina (888-855 BC) between two interceding deities. The text tells how the king made a new cultic statue for the god and gave privileges to his temple. Divine council in Olympus: Hermes with his mother Maia, Apollo playing kithara, Dionysos and a maenad. Side B of an Attic red-figure belly-amphora, ca. 500 BC. A Divine Council is an assembly of deities over which a higher-level god presides. The concept of a divine assembly (or council) is attested in the archaic Sumerian, Akkadian, Old Babylonian, Ancient Egyptian, Babylonian, Caananite, Israelite, Celtic, Ancient Greek and Ancient Roman and Nordic pantheons. Ancient Egyptian literature reveals the existence of a "synod of the gods". Some of our most complete descriptions of the activities of the divine assembly are found in the literature from Mesopotamia. Their assembly of the gods, headed by the high god Anu, would meet to address various concerns. The term used in Sumerian to describe this concept was Ukkin, and in later Akkadian and Aramaic was puhru. One of the first records of a divine council appears in the Lament for Ur, where the pantheon of Annunaki is led by An with Ninhursag and Enlil also appearing as prominent members. The divine council is led by Anu, Ninlil and Enlil. In the Old Babylonian pantheon, Samas (or Shamash) and Adad chair the meetings of the divine council. The leader of the Ancient Egyptian pantheon is considered to either be Thoth or Ra, who were known to hold meetings at Heliopolis (On). 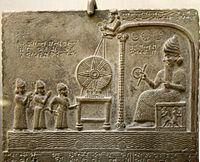 Marduk appears in the Babylonian Enûma Eliš as presiding over a divine council, deciding fates and dispensing divine justice. Texts from Ugarit give a detailed description of the Divine Council's structure of which El and Ba'al are presiding gods. The Old Testament description of the "divine assembly" all suggest that this metaphor for the organization of the divine world was consistent with that of Mesopotamia and Canaan. One difference, however, should be noted. In the Old Testament, the identities of the members of the assembly are far more obscure than those found in other descriptions of these groups, as in their polytheistic environment. Israelite writers sought to express both the uniqueness and the superiority of their God Yahweh. The Book of Psalms (Psalm 82:1), states "God (אֱלֹהִ֔ים elohim) stands in the divine assembly (בַּעֲדַת-אֵל ); He judges among the gods (אֱלֹהִ֔ים elohim)" (אֱלֹהִים נִצָּב בַּעֲדַת־אֵל בְּקֶרֶב אֱלֹהִים יִשְׁפֹּט). The meaning of the two occurrences of "elohim" has been debated by scholars, with some suggesting both words refer to Yahweh, while others propose that the God of Israel rules over a divine assembly of other Gods or angels. Some translations of the passage render "God (elohim) stands in the congregation of the mighty to judge the heart as God (elohim)" (the Hebrew is "beqerev elohim", "in the midst of gods", and the word "qerev" if it were in the plural would mean "internal organs"). Later in this Psalm, the word "gods" is used (in the KJV): Psalm 82:6 - "I have said, Ye [are] gods; and all of you [are] children of the most High." Instead of "gods", another version has "godlike beings", but here again, the word is elohim/elohiym (Strong's H430). This passage is quoted in the New Testament in John 10:34. In the Books of Kings (1 Kings 22:19), the prophet Micaiah has a vision of Yahweh seated among "the whole host of heaven" standing on his right and on his left. He asks who will go entice Ahab and a spirit volunteers. This has been interpreted as an example of a divine council. The first two chapters of the Book of Job describe the "Sons of God" assembling in the presence of Yahweh. Like "multitudes of heaven", the term "Sons of God" defies certain interpretation. This assembly has been interpreted by some as another example of divine council. Others translate "Sons of God" as "angels", and thus argue this is not a divine council because angels are God's creation and not deities. "The role of the divine assembly as a conceptual part of the background of Hebrew prophecy is clearly displayed in two descriptions of prophetic involvement in the heavenly council. In 1 Kings 22:19-23... Micaiah is allowed to see God (elohim) in action in the heavenly decision regarding the fate of Ahab. Isaiah 6 depicts a situation in which the prophet himself takes on the role of the messenger of the assembly and the message of the prophet is thus commissioned by Yahweh. The depiction here illustrates this important aspect of the conceptual background of prophetic authority." In Chinese theology, the deities under the Jade Emperor were sometimes referred to as the celestial bureaucracy because they were portrayed as organized like an earthly government. In Celtic mythology, most of the deities are considered to be members of the same family - the Tuatha Dé Danann. Family members include the Goddesses Danu, Brigid, Airmid, The Morrígan, and others. Gods in the family include Ogma, the Dagda, Lugh and Goibniu, again, among many others. The Celts honoured many tribal and tutelary deities, along with spirits of nature and ancestral spirits. Sometimes a deity was seen as the ancestor of a clan and family line. Leadership of the family changed over time and depending on the situation. The Celtic deities do not fit most Classical ideas of a "Divine Council" or pantheon. Zeus and Hera preside over the divine council in Greek mythology. The council assists Odysseus in Homer's Odyssey. Jupiter presides over the Roman pantheon who prescribe punishment on Lycaon in Ovid's Metamorphoses, as well as punishing Argos and Thebes in Thebaid by Statius. There are mentions in Gautreks saga and in the euhemerized work of Saxo Grammaticus of the Norse gods meeting in council. The gods sitting in council in their judgment seats or "thrones of fate" is one of the refrains in the Eddic poem "Völuspá"; a "thing" of the gods is also mentioned in "Baldrs draumar", "Þrymskviða" and the skaldic "Haustlöng", in those poems always in the context of some calamity. Snorri Sturluson, in his Prose Edda, referred to a daily council of the gods at Urð's well, citing a verse from "Grímnismál" about Thor being forced through rivers to reach it. However, although the word regin usually refers to the gods, in some occurrences of reginþing it may be simply an intensifier meaning "great", as it is in modern Icelandic, rather than indicating a meeting of the divine council. ^ a b Sakenfeld, Katharine ed., "The New Interpreter's Dictionary of the Bible" Volume 2, pg 145, Abingdon Press, Nashville. ^ E. Theodore Mullen (1 June 1980). The divine council in Canaanite and early Hebrew literature. Scholars Press. ISBN 978-0-89130-380-0. Retrieved 25 September 2012. ^ a b Leda Jean Ciraolo; Jonathan Lee Seidel (2002). Magic and Divination in the Ancient World. BRILL. pp. 47–. ISBN 978-90-04-12406-6. Retrieved 25 September 2012. ^ Virginia Schomp (15 December 2007). The Ancient Egyptians. Marshall Cavendish. pp. 71–. ISBN 978-0-7614-2549-6. Retrieved 25 September 2012. ^ Alan W. Shorter (March 2009). The Egyptian Gods: A Handbook. Wildside Press LLC. pp. 42–. ISBN 978-1-4344-5515-4. Retrieved 25 September 2012. ^ Leo G. Perdue (28 June 2007). Wisdom Literature: A Theological History. Presbyterian Publishing Corp. pp. 130–. ISBN 978-0-664-22919-1. Retrieved 25 September 2012. ^ Mark S. Smith (2009). The Ugaritic Baal Cycle. BRILL. pp. 841–. ISBN 978-90-04-15348-6. Retrieved 25 September 2012. ^ Michael S. Heiser. "Divine Council 101: Lesson 2: The elohim of Psalm 82 – gods or men?" (PDF). ^ HamMilon Hechadash, Avraham Even-Shoshan, copyright 1988. ^ "godlike beings, in JPS 1917". Retrieved 18 March 2013. ^ "Psalm 82:6 KJV with Strong's H430 (elohim/elohiym)". Retrieved 18 March 2013. ^ "John 10:34". Retrieved 18 March 2013. ^ Bruce Louden (6 January 2011). Homer's Odyssey and the Near East. Cambridge University Press. pp. 17–. ISBN 978-0-521-76820-7. Retrieved 25 September 2012. ^ Randall T. Ganiban (8 February 2007). Statius and Virgil: The Thebaid and the Reinterpretation of the Aeneid. Cambridge University Press. pp. 54–. ISBN 978-0-521-84039-2. Retrieved 25 September 2012. ^ John Lindow (2002) . Norse Mythology: A guide to the Gods, Heroes, Rituals and Beliefs. Oxford, New York: Oxford University Press. p. 26. ISBN 9780195153828. ^ Viktor Rydberg (1907) . Teutonic Mythology. 1 Gods and Goddesses of the Northland. Translated by Rasmus B. Anderson. London, New York: Norroena Society. pp. 210–11. OCLC 642237. ^ Samuel Hibbert (1831). "Memoir on the Tings of Orkney and Shetland". Archaeologia Scotica: Transactions of the Society of Antiquaries of Scotland. 3: 178. ^ Ursula Dronke (2001) . The Poetic Edda (her translation of rǫkstólar). 2 Mythological Poems. Oxford, New York: Clarendon Press, Oxford University Press. pp. 37, 117. ISBN 9780198111818. ^ The Prose Edda of Snorri Sturluson: Tales from Norse Mythology. Translated by Jean Young. Berkeley: University of California Press. 1964 . pp. 43–44. ISBN 9780520012325. This page was last edited on 17 February 2019, at 16:41 (UTC).